As a part of the 2018 PLACCC festival, the SHAPERS performance was presented in front of the Rákóczi tér marketplace. The beautiful and powerful performance by 8 dancers from Arab and European countries represents the openness towards other people, and I wanted to bring this openness and acceptance to the toxic atmosphere that the government propaganda creates in Hungary … Rákóczi square is situated on the border of a poorer and ambivalent district of Budapest, but it has been under development and gentrification in the past years. For a review of the performance by Zsuzsanna Komjathy, click here. The performance was followed by a discussion led by curator Gábor Pinter, from the Parallel Art Foundation with speakers: Anne Le Batard, choreographer and co-director of the Ex Nihilo company, Elvi Balboa & Ahmed Shamel, participating dancers in the SHAPERS project, Martin BOROSS from the Stereo Akt company, and Réka SZABÓ from The Symptoms company. 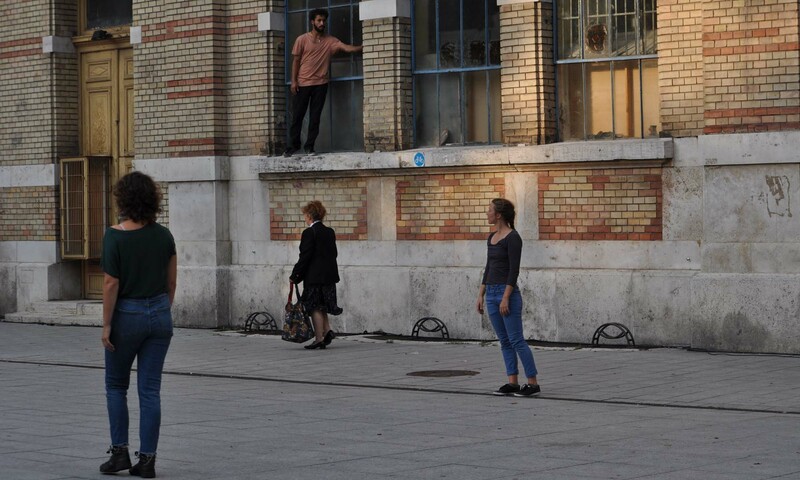 In 2018 the PLACCC festival continued its work of the past 10 years, once again hosting site-specific artistic events in public spaces and at unique venues. The keywords of the festival for this year were body and technology, with a programme mainly consisting of dance productions and projects based on new technologies.